Cut each filo sheet in half lengthways, then into three crossways. Lightly brush one filo square with butter. Top with another filo square on an angle to form a star shape. Repeat layers with another two filo squares. Place pastry into a lightly greased ⅓ cup capacity muffin pan. Repeat with remaining pastry and butter to make 12 pastry cups. Bake pastry cups for about 5 minutes or until browned lightly and crisp; cool. Meanwhile, reserve half of the best slices of salmon. Blend or process the remaining salmon with ricotta, horseradish cream and lemon juice until smooth. Stir in the chives. Season to taste with freshly ground black pepper. 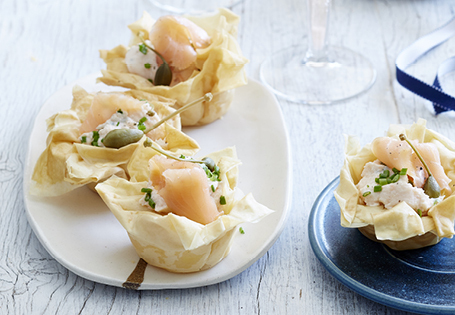 Fill pastry cups with ricotta mixture; top with reserved salmon slices, caperberries and extra chives.